Foursquare 6.2.2 for iOS has just been released. The app now lets Check your friends in at a location. 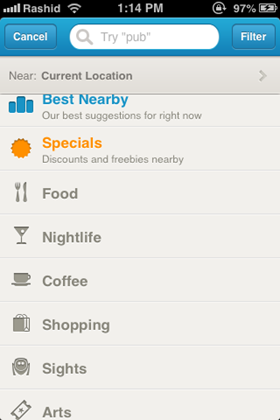 The updated Foursquare 2013.06.25 Android app is also available on the Play Store. 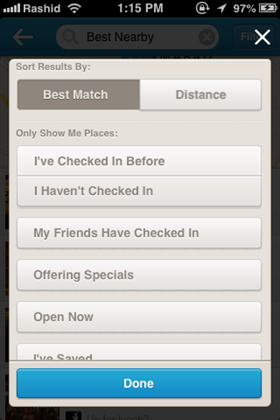 Purpose of this new feature is to save time when you are out with friends as you can check them in as well. This works with their permission of course. In addition, there are some new filters added in search that lets you search easily and effectively. Just tap on search bar, then tap on a filter to get the results that you are actually looking for. This will certainly help users find the places that they are looking for. Plus with new filters in Explore, you can do searches to suit your every need. Looking for a cheap, friend-approved lunch spot that you haven’t tried yet? Or maybe you want to sort your coffee recommendations by distance. Tap the search bar at the top of the screen, then filter by options like “price,” “specials,” “distance,” “haven’t been,” or “open now” to find the perfect place.